"A classic, simple beef stew recipe that my grandmother developed and that is now being enjoyed by a fourth generation in my family. Delicious with salad and a crusty bread." Heat the oil in a large pot over medium heat. Place the meat in a bowl, sprinkle with flour, and toss to coat. Transfer meat to pot, season with salt and pepper, and brown meat on all sides. Fill the pot with enough water to cover the meat, and mix in onion, bay leaf, and tomato sauce. Bring to a boil, reduce heat to low, cover, and simmer for an hour or until the meat is tender. Stir in the potatoes, carrots, and celery. Continue cooking over low heat for 45 minutes, until vegetables are tender. Remove bay leaf before serving. A very delicious recipe, and so easy to prepare! 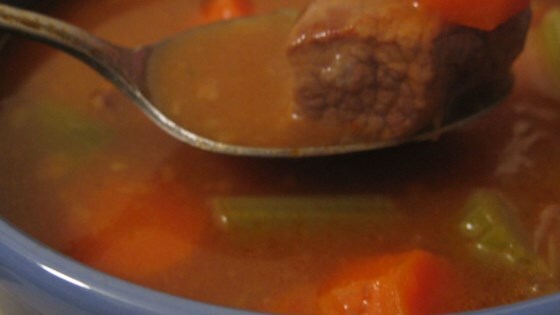 I used beef broth instead of water, and it sure gave it that slow-cooked, savory taste!